I just love when forgeries make the headlines. This case happened in China and if you’re living in Asia, this is a huge case for you. But here in America, we didn’t hear much about it. A woman named Nina Wang passed away leaving $13 billion at stake from a forged will. According to the court records, guess who forged it? Her feng shui master. In Asia, having a Feng Shui master can be fairly common. However, Ms. Wang was having an affair with hers. But would you really leave him $13 billion with a will written in English when in fact your native language is Mandarin? I’m sure there were many Asian handwriting experts involved in this case as the court deemed the will a forgery. As an aspiring handwriting expert, you should realize that this is exactly the kind of case that can put your career on the map and on auto pilot. Even if you are not hired for the case and given the chance to comment, newspapers and TV shows will put you on the air to discuss it. If you talk about any high profile murder or any famous person that is involved in a murder or a criminal act or in this case, forgery, you can comment on it and be the talking head even if you’re not hired by the plaintiff or the defense. I wasn’t commenting on this case because this one was mainly in Asia. But if you recall back when JonBenet Ramsey was murdered, I was given the opportunity to comment on the handwritten note that was found. On a legal note, wills differ from every state and country. There’s something called a holographic will which means that the will was written entirely in a person’s own handwriting, and signed. If somebody types a will and that person signs it, then it’s not a holographic will and so you should consult an attorney or check the laws before you really get involved with a will and testament. Your job as a handwriting expert is to confirm or deny the identity of the person that reportedly offered the will. In this case, there is $13 billion at stake and I think the forgerer, the feng shui master, Tony Chan is going to jail for forgery because the court finds him guilty. The kicker is she actually did leave him $10 million, but since he didn’t want just $10 million, he chose to forge the will. Now he will be spending time in prison and at the same time forfeited the $10 million that his lover gave to him. Enjoy the article. The Nina Wang case captivated Asia in much the same way the Brooke Astor case made headlines in New York last year. Only instead of questions surrounding whether a multi-millionaire’s will was invalid, the Nina Wang case involved whether Tony Chan Chun-chuen forged the will of Asia’s richest woman, to the tune of about thirteen billion dollars, according to some estimates. She died at age 69 in 2007. 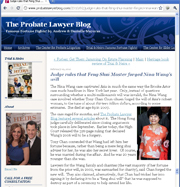 The case raged for months, and The Probate Lawyer Blog featured several articles about it. The Hong Kong judge carefully deliberated since closing arguments took place in late September. Earlier today, the High Court released the 326-page ruling that declared Wang’s 2006 will to be a forgery. Tony Chan contended that Wang had left him her fortune because, rather than being a mere feng shui adviser for her, he was also her secret lover. Of course, he was married during the affair. And he was 20 years younger than she was. Lawyers for the Wang family and charities (the vast majority of her fortune from the prior will, in 2002, was earmarked for charity), said Chan forged the new will. They also claimed, alternatively, that Chan had tricked her into signing it by declaring it to be a “feng shui will” that he was supposed to destroy as part of a ceremony to help extend her life. Nina Wang did have an intimate relationship with Tony Chan, but she wanted to keep it a secret. Despite giving him lavish gifts and payments of money, she didn’t want to give him her entire fortune. Rather, she held true to her wishes in the 2002 will, leaving most of her wealth to charity. Wang did, in fact, sign a new document in 2006. But it wasn’t the will Tony Chan said it was. No — that one was forged . . . through a “highly skilled simulation”. Instead, Wang signed a Specific Bequest Will leaving Chan $10 million (poor guy). The Judge didn’t find Chan believable — pointing to his criminal past, among other reasons. Chan lied and withheld relevant information from the Court, the Judge said. And, the 2006 will was written in English, not Chinese like the 2002 will. The judge also said he didn’t believe Chan’s wife either, who also offered testimony to support the validity of the 2006 will. Chan’s lawyer already promised an appeal. But, Chan has other concerns in the meantime. Chan may be referred for criminal prosecution based on the finding of forgery. And he won’t even have the $10 million from the “Specific Bequest Will”. That partial will wasn’t located and Chan didn’t offer it for admission to the Court. So he may not even get that amount. The real irony here is that Chan’s path is eerily similar to Nina Wang’s. Her husband was kidnapped in 1990 and was never found. (In fact, that’s how she met Chan — he was supposed to help locate her husband). After Wang’s husband was declared dead, the father-in-law challenged the will that left Nina Wang with everything. And, just like in this case, the will was found to be a forgery and Nina Wang was charged criminally. But, Nina Wang ultimately won on appeal and was exonerated. She inherited her husband’s fortune, despite originally losing her case. Will her feng shui master/former lover be as lucky on appeal? Feb 4, 2010 Update — Tony Chan has been arrested because of the ruling.